You are viewing UMX > Beads > Glass Beads and Glass Bead Supplies With Unique Glass Arts, Gorgeous Glass Colors and Beautiful Glass Shapes. Glass was invented at around 2500 B.C. At first glass was used for making glass beads, seals, and architectural decoration. It is an amorphous solid material made by fusing silica with a basic oxide. Glass is neither a solid nor a liquid but exists in a vitreous or glassy state. Glass is made from three main materials: silica (sand), lime and sodium carbonate (soda or alkali). Glass is formed when sand, soda and lime are fused at high temperature. Some other miner percentage of minerals are added to give special features to glass or to facilitate the glass-making process. The color of the glass can be altered by adjusting the atmosphere in the furnace and by adding specific metal oxides to the glass "batch" (such as antimony and manganese for colorless glass, cobalt for dark blue and tin for opaque white ). We supply a variety of glass beads and glass bead supplies with different style of glass arts, colors and shapes available. Our glass beads have different materials to meet your bead crafts' special requirement. We carry glass beads made of real glass material. We also have beads made of plastic glass or acrylic glass material too. Please check our online catalogs for more glass bead supply information. UMX > Beads > Glass Beads. Sosa-Lime Glass is the most commonly used commercial glass, almost 90% of glass are soda-lime glass. It is also the least expensive one. It usually contains 60-75% silica, 12-18% soda, and 5-12% lime. Soda-lime glass is primarily used for bottles, vases, jars, drinking glasses, glass ornaments, glass beads, glass crafts, marbles, glass arts and window glass etc. Soda-lime glass is resistant neither to high temperatures nor sudden thermal changes, nor to corrosive chemicals. Lead glass has a high percentage of lead oxide (at least 20% ). Lead glass has a relatively soft surface, making it easier for grinding, cutting, casting, sculpturing, flame working, engraving and glass fusing processes. Lead glass are used in a lot of different style application, like making glass crafts, Lampworks, etched glass arts, marbles or handmade glass beads. Lead glass can't stand high temperatures or sudden changes in temperature. Borosilicate glass, is an silicate glass having at least 5% of boric oxide in its composition. It has greater resistance to thermal changes and chemical corrosion. Borosilicate glass is widely used in chemical processing plants, in laboratories, for ampoules and vials in the pharmaceutical industry, lampwork glass beads, glass crafts, and bulbs for high-powered lamps, etc. Borosilicate glass is also used in the home for cookware. Glass is the latest "Hot Collectible" and glass flamework is one of the most ancient techniques for glass crafting. By melting and fusing glass over a gas-oxygen flame using both clear and colored glass you can create a handmade glass beads with spectacular arts. There are a lot of one of a kind sensational creations, handmade collectable glass beads with love and care. We are glass beads wholesalers, suppliers, distributors, retailers, vendors, importers, exporters and manufacturers. 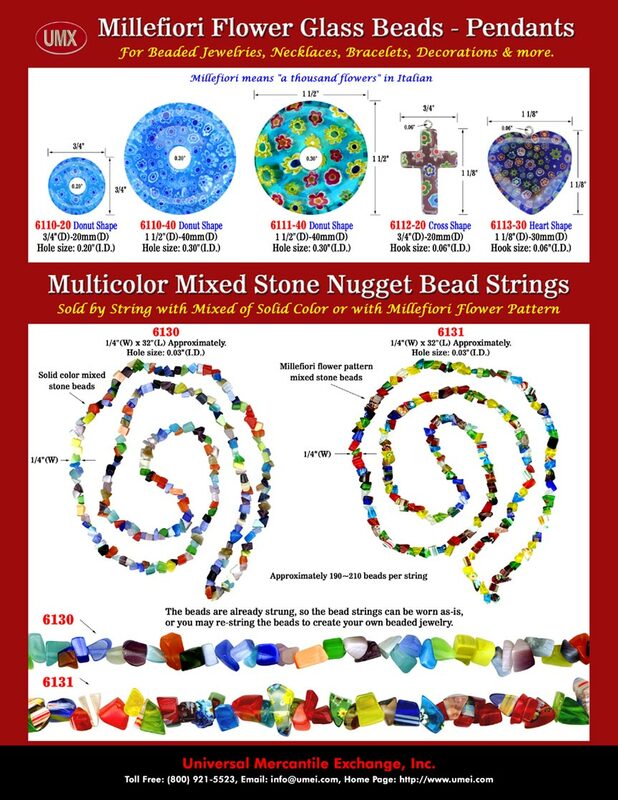 We wholesale a variety of unique glass beads, bead strings and bead strands to international and domestic wholesale glass bead stores and wholesale glass bead shops. Millefiori Glass Beads: Millefiori Flower Pattern Glass Beads, Millefiori Glass Pendants and Millefiori Glass Pendant Beads. You are viewing UMX > Beads > Glass Bead and Glass Beads Supply With Unique Glass Art, Gorgeous Glass Color and Beautiful Glass Shape.